Students, faculty, staff and community members gathered September 6, 2013 on the campus of the University of Central Oklahoma in Edmond, Oklahoma to dedicate the new 11-circuit paver medieval labyrinth which is the first labyrinth on a public university campus in Oklahoma. 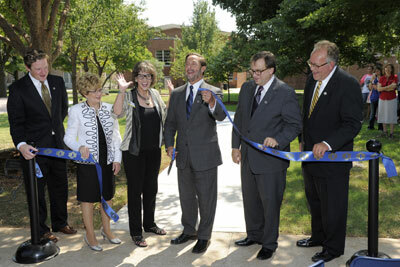 President Don Betz along with members of the President’s cabinet and Dr. Diane Rudebock, Campus Labyrinth Project Coordinator (3rd from left, below), cut the ribbon officially opening the labyrinth to campus and the community. Music was provided by students from the University of Central Oklahoma School of Music. The labyrinth was created by Marty Kermeen, Artist and Founder of Labyrinths in Stone. The labyrinth is a beautiful work of interactive art located in Heartland Plaza, an area dedicated to the families and responders to the 1995 Oklahoma City Bombing. 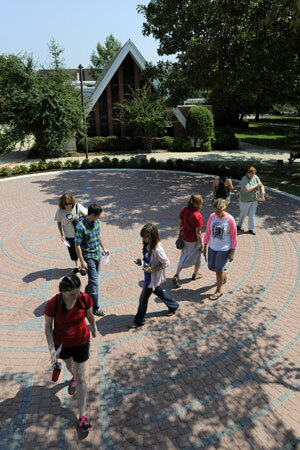 The Y Chapel of Song borders the east side of the labyrinth area, and beautiful native Oklahoma trees surround the 42 foot paver labyrinth which is an exact replica of the labyrinth in Chartres France.